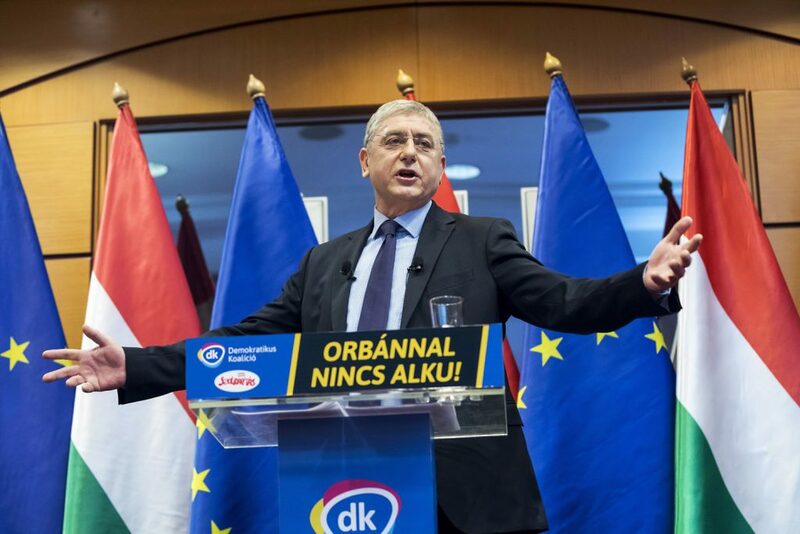 An “unforgivable sin” is how Ferenc Gyurcsány depicts the Hungarian Liberal Party’s position on the October 2016 migrant quota referendum referendum, and for this reason he no longer trusts the party’s founder, former Alliance of Free Democrats (SzDSz) politician Gábor Fodor. On whether he would run for prime minister in 2022, the former Socialist prime minister (2004-2009) who left the Hungarian Socialist Party (MSZP) in October 2011 to launch Democratic Coalition (DK), answered evasively. Gyurscány also could not say whether he would accept an invitation to attend an anti-fascist demonstration against plans to hold a commemorative mass for former head of state Miklós Horthy at the Homecoming Church in Budapest’s Freedom Square. Last Tuesday Gyurcsány was a guest at the Republikon Institute’s “Who should liberals votes for?” panel discussion, part of a series of discussions on this subject. The following interview with the opposition politician was conducted immediately afterwards. Budapest Beacon: If I understand correctly, the panel discussion implied that Gábor Fodor or his Hungarian Liberal Party (MLP) had been bought by the kilogram by Fidesz. Ferenc Gyurcsány: No, I made no such reference. BB: Then I misinterpreted your remarks. To what where you referring when you said you were not rooting for Gábor Fodor? F. Gy. : I told him and stated publicly as well that I consider it an unforgivable sin that they participated in the 2016 autumn referendum. The entire democratic opposition supported a boycott as the only obvious possible strategy. They, on the other hand, encouraged participation. BB: To what entire democratic opposition are you referring? The Hungarian Two-tailed Dog Party (MKKP) encouraged people to vote in an invalid manner. F. Gy. : Well, yes, of course. But the invalid voting did not help its validity. Returning to Fodor, I think opposition unity must not be broken by such matters, and I no longer trust anyone who does so once. BB: Considering support of MLP is less than one percent of the electorate, what do you think of MSZP concluding an electoral agreement with MLP? F. Gy. : I don’t know. We were never given an explanation when we met with MSZP. F. Gy. : I don’t see the night of April 8th either, at best I’m working for what we would like. How could I possibly see as far as 2022? BB: Let’s see that as the head of an opposition faction that raises the party to the point where it becomes Viktor Orbán’s challenger. So you haven’t answered my question. Do you have ambition to become prime minister in 2022? F. Gy. : I don’t know what my ambition will be looking at 2022. BB: Do you have any ambition now to be prime minister looking at 2022? F. Gy. : I am not thinking about 2022 now, but I would like for us to win in 2018. BB: In the near future the Miklós Horthy Association is organizing a mass in honor of the former leader (Regent of Hungary, 1920-1944) in the Homecoming Church in Freedom Square. Anti-fascist organizations will hold a protest. To my knowledge they have invited the heads of many democratic parties to join the demonstration. Do I understand correctly that DK said no to participating in the protest? F. Gy. : To be honest I am not aware of anyone contacting me. For this reason I cannot correctly answer because I am in the habit of knowing whether somebody contacts me, and my colleagues, on the other hand, perform their jobs relatively well and notify me if such a letter arrives. I am not aware of any such invitation. BB: If they invite you, would you attend an antifascist demonstration? F. Gy. : I don’t know. I don’t know what the appropriate behavior is in this case. In any event I would think on it for a day were I to receive such an invitation.